Avondale, the Paarl property owned by the Grieve family, operates according to a combination of organic, biodynamic and scientific principles. The wines are idiosyncratic, none more so than the white blend that is Cyclus. 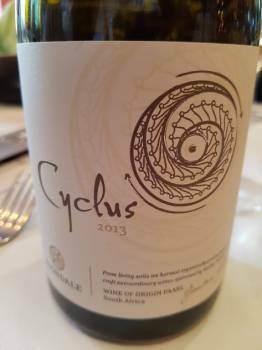 It’s composition is approximately 25% each of Chenin, Roussanne, Viognier, with the remainder being Chardonnay and Semillon. Juice is fermented spontaneously, 15% on the skins and maturation lasts some 12 months in 500- and 600-litre barrels, 15% new (clay amphorae also incorporated from the 2013 vintage). Yesterday proprietor and viticulturist Jonathan Grieve presented a vertical tasting from the maiden vintage 2009 to the current-release 2013 and the curiousness of the wine was reinforced – this is not to say I don’t appreciate it (I nominated the 2011 for 5 Stars when still a taster for Platter’s) but it is a stylistic outlier being particularly oxidative, upfront fruit typically not very much in evidence. To the wine’s credit, it does appear very stable over time, the 2009 drinking as well as any of the vintages to date. The 2013 is smart. A floral top note before citrus, peach and spice plus some yeasty complexity. Good fruit expression, relatively speaking, but also satisfying weight and texture, the finish nicely savoury. No doubt the wine will age but I would be inclined to drink it sooner rather than later. Price: R260 a bottle. Previous articleDax Villanueva: Should you cook with olive oil?